Discussion in 'The Kitchen Knife' started by TaJ, Mar 1, 2014. 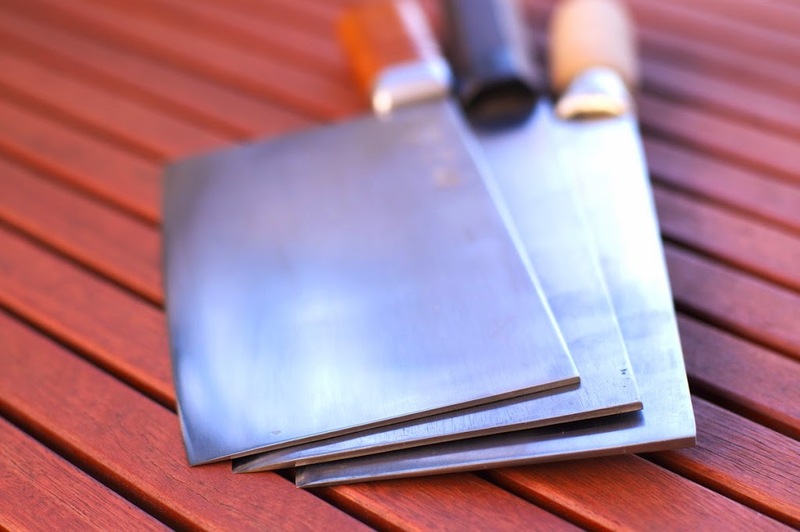 I'm looking for a slicing cleaver and want to make up my mind on what size, profile, weight, steel, kind of handle, finish and such. 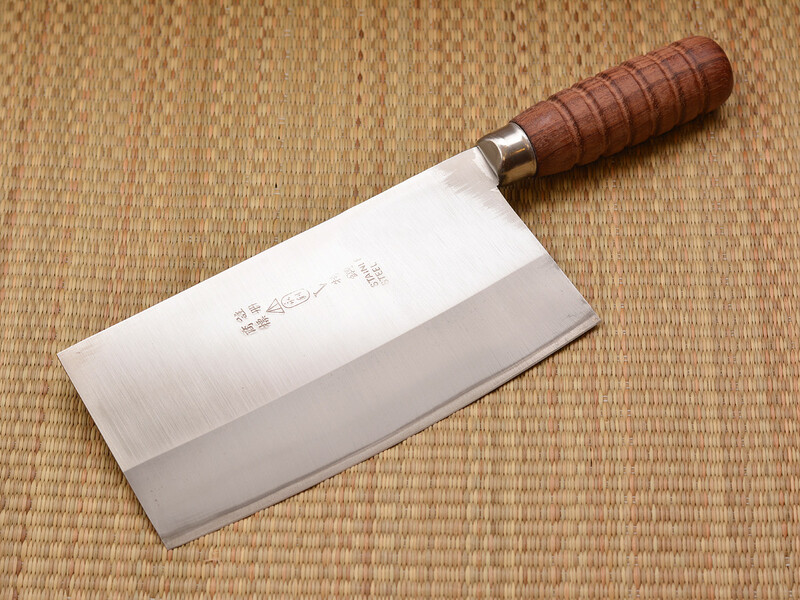 What kind of cleaver do you own and what do you like about it? with sharp shinogi line that helps food separation, and thin at the edge. like my other Shigefusa knives, superb. Here's my favorite one, a Shigefusa custom made for me. A first from him as I understand it. I like how the Heiji looks with the distinct Shinogi. 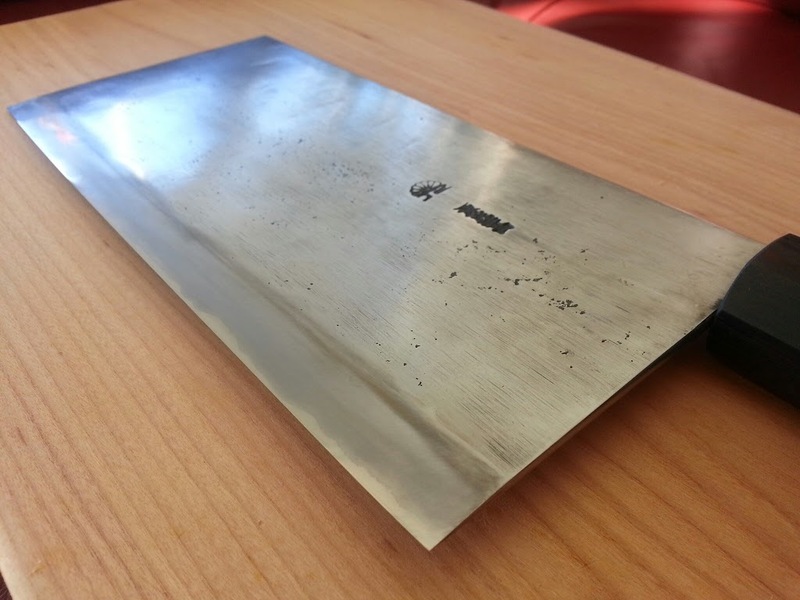 Also the stainless and the Kuro-Uchi on the Shigefusa looks like something i would like. That's because the real estate to take care of is so big. 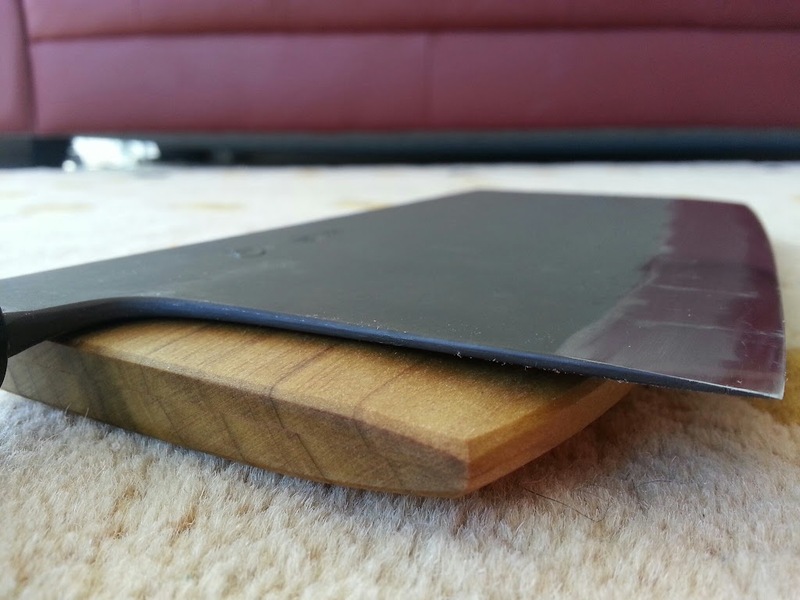 Also, the rustic look fits a cleaver somehow. One question concerning the Shigefusa cleavers. 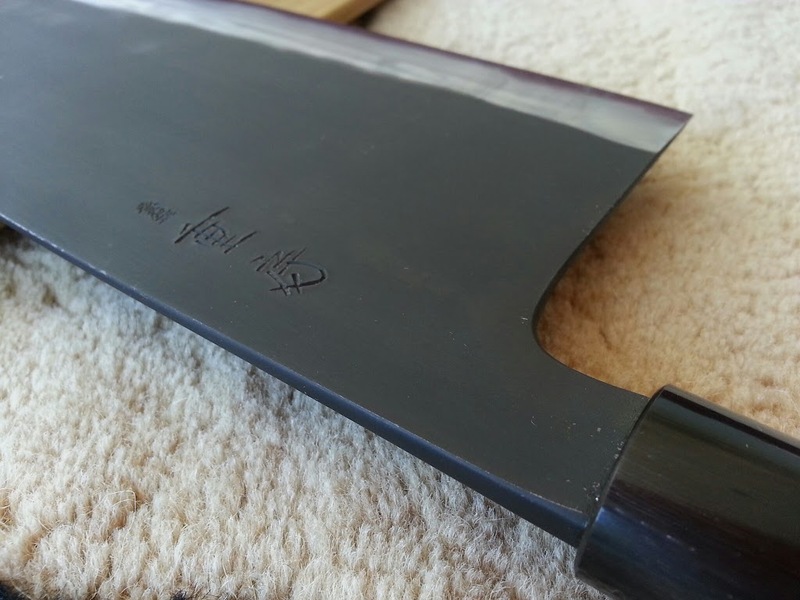 As compared to other cleavers i've seen, the Choil is quite 'big' as in other japanese knifes and similar to the Shigefusa Gyuto or Deba for instance, meaning it's a big arch and puts the heel of the knife quite far away from the end of the handle. How is this affecting the grip you use with this cleaver? As for the Heiji, is the spine rounded a bit? Does it feel comfortable? Them's some gorgeous shiggys. Love those. first for wa handle with his typical neck, I think. 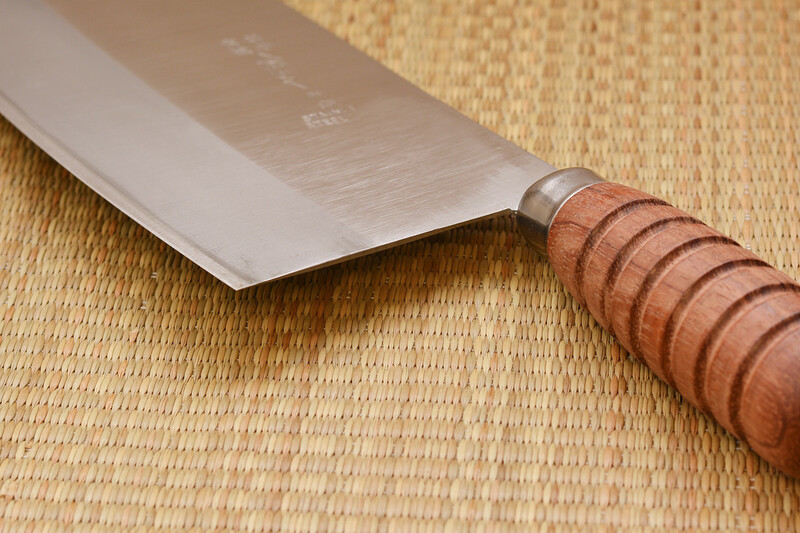 For Heiji chuka spine, it came slightly rounded and corner eased like his gyuto and santoku that I also have. of the other design. Sugimoto handle still feels best for me as well as being a rat tail tang. In any case, I have found that following grip (with variations depending on the type of cut) feels best for this Shig chuka. And for one meal at a time usage at home, it is comfortable enough for me. Thank you for your explanations schanop. 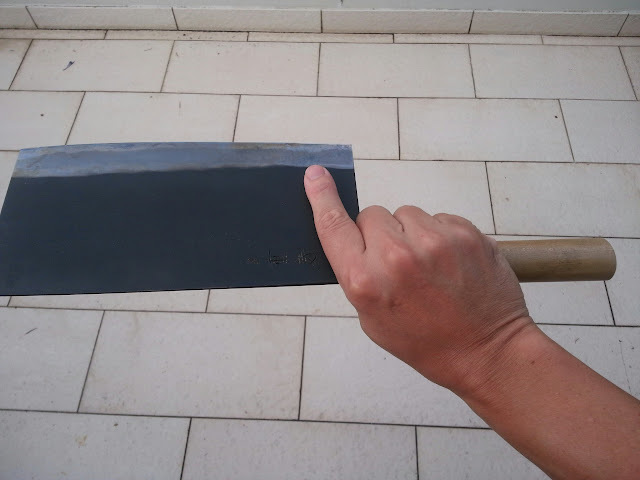 There seems to be a kind of a good grip possible (as seen in your pictures) with the Shigefusa and i guess the rounded and meaty choil/tang helps. I can see why the Sugimoto would be comfortable. It seems, this would enable you to have two fingers on the right side of the blade and still have a fair bit of handle in the hand . With a Wa-handle i guess a very thick oval handle would be closest to it. I've used this veggie cleaver for decades now. Been so happy with it that I purchased several as gifts. Messes Made..... Jobs Left Undone..... FREE Estimates!!! turtle, this one looks interesting as in the heel goes back a bit and the choil seems to enable to slide the hand quite a bit in front. That's exactly one of the main point, being able to use pistol grip or two fingers down the blade if needed. Very large octagonal handle on Moritaka that I used to own is fine too. A couple of pre-own chukkas. First was Moritaka blue #2, custom order at 220x110 and 550g: This one was a beast. I already had Sugimoto #6 at the time of ordering and wanted something along the line of Sugimoto #7. Being this big and heavy, it excelled at protein. Going though hard dense vegetable, this one would wedge a bit. For a more complete reference, Sugimoto #6, 220x110 420g. 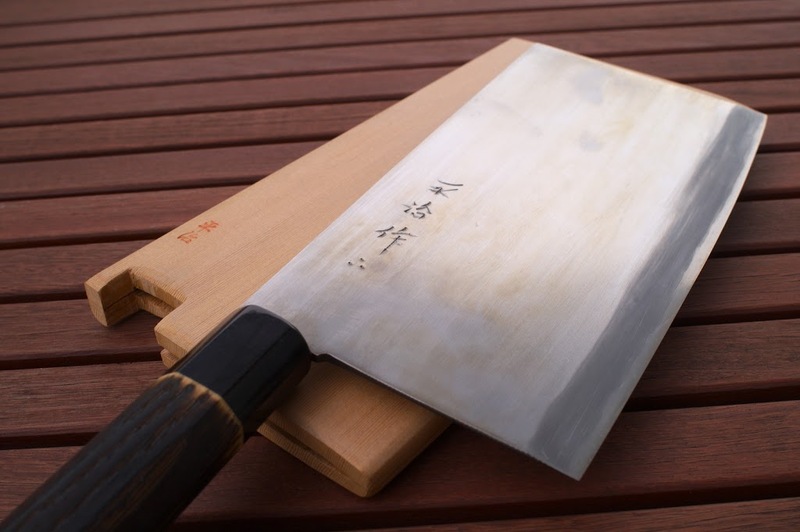 It was a very very good cleaver overall for me, but in the end, I wanted something that would be a little easier to take care of during busy meal. Following photos show Sugimoto #6 on top, Moritka in the middle, a Leung Tim BBQ chopper at the bottom. Birnando I remember that Shigefusa It was beautful. Takeda was nice as well but I think that it was very uncomfortable. 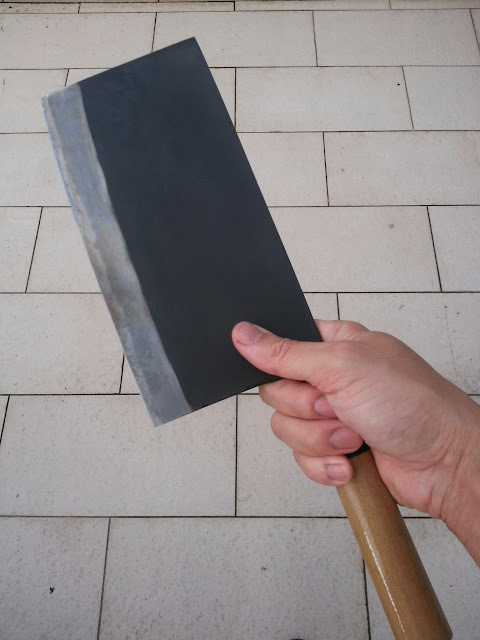 I might be one of the first to post a Chinese (Taiwanese) cleaver? 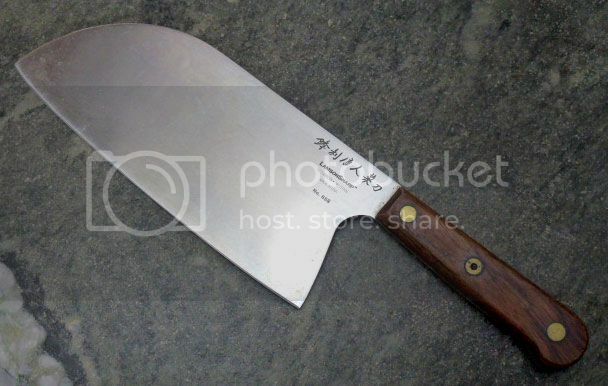 Bear in mind this is also a "smaller" cleaver, for home use...about 180mm at the edge. @TaJ Thanks for starting this thread, I am also looking to get a nice cleaver! I see the sugimoto cleavers are still considered as really good. One question though what's the difference between #6 and #7? #6 is the thin blade model, #7 is the medium blade, and is c. 100 grams heavier. So you would use the #6 for mainly vegetables and the #7 is more of an all-rounder? Which one would you get as your first one? Wow, cool cleavers coming in! schanop, nice comparison shots. 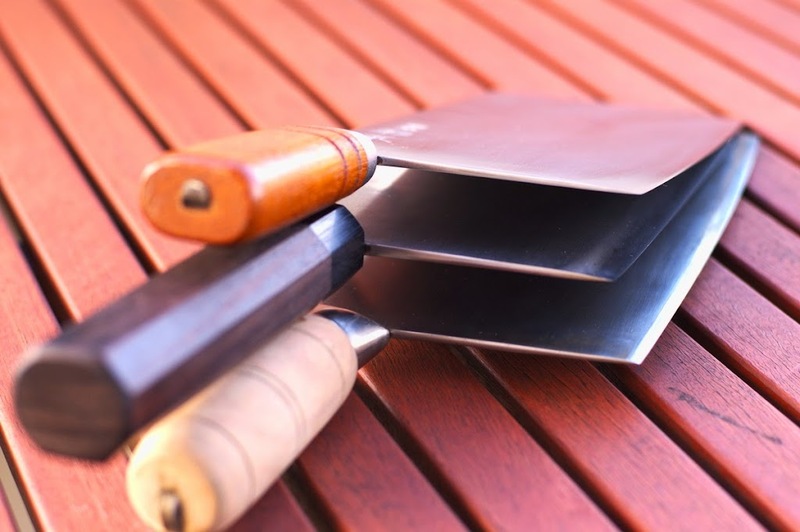 To the chinese cleaver from you XooMG, are there higher end versions of these as well, like rounded spine and better finished or is this just not in demand (or the void filled by chuka-bocho)? The ChickenHawk cleaver looks cool, but a bit intimidating, especially as i've just cut myself a bit. Concerning the Sugimoto #6 and #7, i am interested in why one would chose one above the other as well. 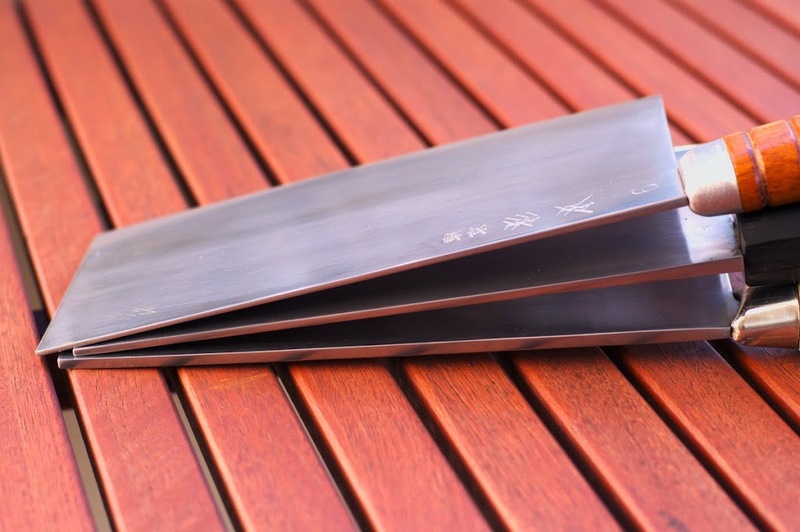 To the chinese cleaver from you XooMG, are there higher end versions of these as well, like rounded spine and better finished or is this just not in demand (or the void filled by chuka-bocho)? If they make them, I haven't seen them. Quite a shame, since the blade looks like it's got a lot of potential. I am a bit afraid to do a rehandle myself, but have given some thought to refinishing the blade. Assuming the tang is OK, I think one of these with some work may be in the league of some of the Japanese chukabocho. Could be a business idea. Buy these chinese cleavers without handle directly from the manufacturer, finish them nicely, add a nice handle and sell them as an exclusive line.